Toca Boca’s digital playgrounds have charmed families around the world. Now it’s offering kids ages 5 to 9 a new video service. At first, it’s a familiar scene: three girls curled up on a sofa after school, watching cartoons, with their backpacks dumped in the corner. But there’s no actual TV to complete the picture. Instead, each girl holds an iPad loaded with Toca TV, a beta version of a new video product developed by app maker Toca Boca. They giggle as the chronically stymied “evil genius” on screen fails once again—and then move on to the next short video. On either side of the room, in Toca Boca’s Brooklyn offices, two user experience researchers take notes. Toca TV, which launched last week, represents the next phase in Toca’s effort to build a digital-first kids’ franchise. 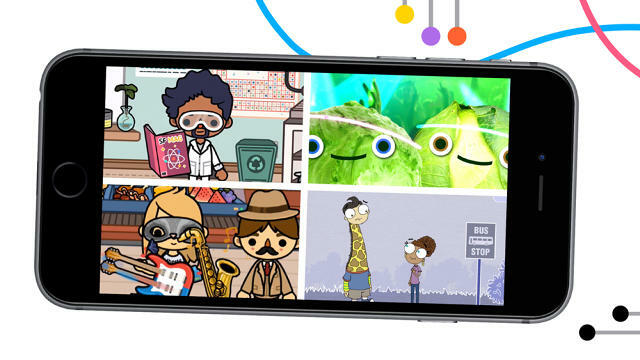 The app costs $4.99 per month and takes direct aim at YouTube with a video library designed for kids ages 5 to 9. Baking tutorials, cute animals, Minecraft skits, silly music videos: The short takes, most less than five minutes in length, mirror the kind of content that can attract millions of views on YouTube. But Toca TV differs from YouTube and other video platforms in two notable ways. For one, the video library reflects Toca’s particular perspective on kid-friendly entertainment. There are no A-B-C’s or 1-2-3’s, for example, because the company focuses, quite simply, on play. “Learning how to be creative, being a good friend, waiting for your turn—there are loads of things that are important to learn but don’t have anything to do with curriculum,” Jeffery says. The result is a set of videos that celebrate being silly (“Don’t mix us up!” a lettuce and a cabbage, wearing glo-sticks and sunglasses, sing in one video) or clever (think epic domino setups) in a way that feels accessible. In addition, the app provides a tool for creating videos, including Snapchat-style stickers. Kids can record and save videos, and with help from a parent, upload their work to a social network like Facebook. But crucially, there is no public sharing within the app: Toca TV itself is closed and private. His team has pulled in content from studios like DreamWorksTV and AwesomenessTV to round out the originals it has been developing in-house, some of which are based on Toca Boca’s apps. All told, Toca TV includes video from more than 75 creators and networks. Back in the testing session, a researcher asks the group to show her how they might search for specific videos. A 9-year-old girl scans her iPad screen, then taps a button. It’s not search, but the video recorder, set to selfie-orientation: Her surprised face stares back at her from between giant biting teeth, a Toca-designed sticker. She smiles, suddenly shy, and then goes back to her dominoes video.